Overwhelmed at the thought of doing a fundraiser? No more! Cure JM now offers a network of expert Fundraising Coaches. Your Fundraising Coach help you get started, answer questions, motivate and inspire you along the way. Fundraisers benefiting Cure JM have helped fund numerous research studies and helped to establish dedicated JM research centers in Chicago and Washington D.C. But there is much more work to do, and fundraising is vital to funding new research opportunities. Every fundraiser makes an impact! Let us help you get started today. Contact Cure JM at or (760) 487-1079. Online Events (such as CrowdRise): These events are so fun, popular, effective and easy that we have a whole team to support them. Erin Curtis first became aware of Cure JM searching the internet while investigating the rash on her 16-month old daughter. 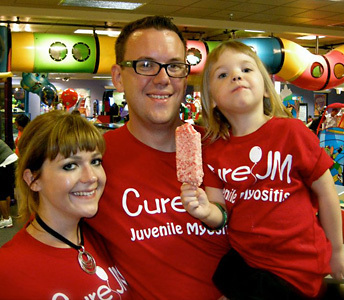 Cure JM’s website helped Erin learn about Juvenile Dermatomyositis and eventually helped lead them to receiving a diagnosis of JDM for their daughter. 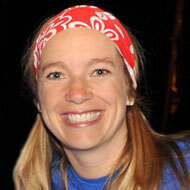 In addition to her role as Family Support Representative, Erin is a Fundraising Coach for Online Events. Online Fundraisers are some of the easiest and most successful fundraisers – they can be competed from home in your spare time just by sending an email! Oftentimes, families can meet or exceed their fundraising goal just by sending a couple of emails. Erin will create a fundraising page for you and give you a sample email to send out. It is that easy and can be so much fun! Jana received her B.S. in Mathematics from Western Washington University. She is a stay at home mom and lives in Pasco, Washington with her husband and their 3 children. 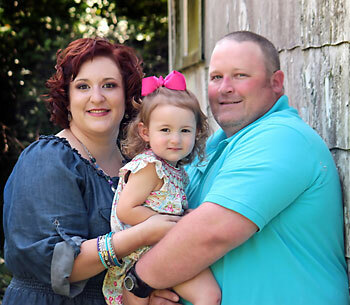 Jana first learned about the Cure JM Foundation in 2008 when she came across their website while looking for answers to what was wrong with her then 3 year old son, Griffin. The pictures and info on the site led her to having him tested and ultimiately diagnosed with JDM. Since that time, Jana has been holding fundraisers, spreading awareness, and supporting other families in her area as well as attending the Seattle National Conference. Jana is excited to become a Family Support Network Representative and she looks forward to supporting other families who are coping with Juvenile Myositis. Shannon has worked with several other non-profit organizations in the past. She became aware of Cure JM Foundation in 2010 when her son was diagnosed with JM. Shannon believes strongly in spreading awareness of JM and raising funds for research. As Cure JM's Fundraising and Operations Coordinator, Shannon supports and assists with family fundraisers, engages corporate sponsors and helps manage Cure JM Foundation’s internal operations. At her annual event, Kristine gathers local artesians together to sell crafts and other items and donate a portion of sales back to Cure JM. Kristine’s event includes many popular vendors, raffle items, bake sale, entertainment and a kids’ zone to keep the children busy while the parents shop. Kristine’s daughter Katherine was diagnosed with JDM at the age of three. Contact Kristine to learn more about how to have a Artesian Craft Fair in your area — we can even help connect you with other Cure JM families in your area who want to help. Lindsay Cleveland has raised over $90,000 for Cure JM in just two years! In March 2012, 800 residents of the small town of Rockdale, TX gathered for the 2nd Annual Cure JM Fundraiser in honor of 7 year old Janey Cleveland. After months of hard work and planning, Janey’s mom, Lindsay, together with her family and friends, hosted the hugely successful event which included bbq plates, Cure JM shirt sales, a raffle, a silent auction, a live auction, and a live band. Lindsay's boundless energy and optimism made the whole event truly special for everyone. 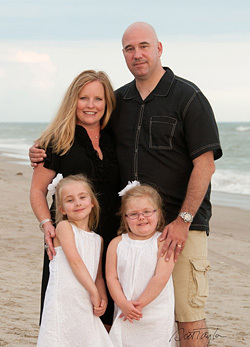 Lindsay became involved in Cure JM when her daughter Janey was diagnosed with JM. Lindsay is very exciting about helping with Cure JM fundraisers around the country and raising money to find a cure for Janey and all kids battling JM. 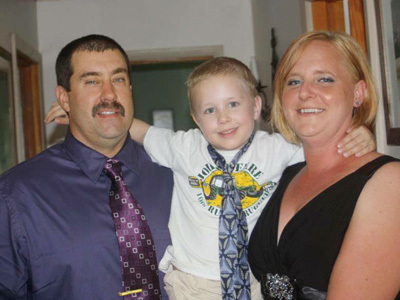 Damon Smedley is the dad of Mason, a young boy severely afflicted by JM who touched the hearts of everyone he met. Mason fought a very courageous, brave battle with JM, but lost his fight in 2012 at the age of 10. Mason’s family says they will continue to raise money and awareness for this horrible disease in hopes that a cure will be found so no other child will have to suffer like Mason did. 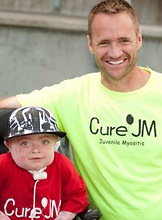 Julie has held so many amazing fundraising events to benefit Cure JM -- in only three years she has raised over $76,000! Julie has held a very successful auction and dinner at the Seattle Space Needle, a bowl and skate party, annual garage sales and more! Julie's creativity, enthusiasm and passion for Cure JM make each event a success. Julie believes in spreading awareness of JM and raising funds that are vital for more research and a cure. Julie and her husband Justyn have two children, Tessa and Lochlan. Tessa was diagnosed with JDM in 2009 at the age of four. In their spare time they enjoy wake boarding, and traveling, especially to Justyn's homeland Australia. 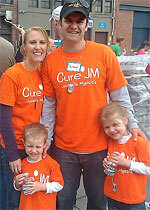 Suzy Clement first became aware of Cure JM when her daughter was diagnosed with JDM in 2007. Since then, Suzy and her family have been active in Cure JM. “Fighting for a cure for our daughter is very important to us,” says Suzy. Suzy is an accomplished professional photographer. In her free time she enjoys running and spending time with her husband, son and daughter. 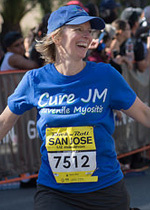 Suzy serves on the Cure JM Advisory Council and also serves as a Fundraising Coach, helping families who want to participate in Cure JM and raise funds for research by running, biking or participating in other endurance events. Ragan's annual golf event, Swing Fore a Cure, has raised almost $100,000 in just two years! In addition to holding her annual golf tournament, Ragan also serves as Secretary of the Cure JM Board of Directors as well as a Family Support Network Liaison. She became involved with Cure JM shortly after her first experience with the Cure JM Conference in Austin, TX. Ragan and her husband Cord ran the Austin ½ Marathon in honor of their son Cooper who was diagnosed with JDM in November of 2008 at age 6. They were inspired by his strength and determination and were so glad that he and his brother were able to be at the finish line when they crossed. Ragan is the mother of 2 boys: Cooper and Camden and is married to the love of her life Cord Cantrelle. 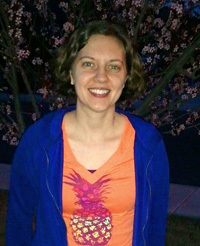 She is a college football fanatic and enjoys running, Zumba, traveling and spending time with her family and friends. Ragan is also a very active volunteer. Her activities have included PTA boards, Vacation Bible School Director, Mary Payton Miracle Foundation Secretary and Board Member and Lock's of Love participant. Kristen will help families design a t-shirt, such as “Keep Calm, Cure JM” or “Team Daisy” or other fun slogans. Kristen will then help families sell the shirts online, donating the proceeds back to Cure JM. Kristen has raised several thousand dollars selling t-shirts in honor of her daughter Daisy, who was diagnosed with JDM at the age of three. Erin has successfully hosted a variety of fundraising events and is ready to help you get started today. Erin enjoys fundraising because it is a fun way to take action and help fund critical JM research.